The road is typically an interesting place – an opportunity to experience new things, see new sights and sounds, and live out of a suitcase for days on end. For the Boise Hawks, it has turned into home during the month of August, as the team has three days remaining on a stretch of 19 road contests in 24 day. But, as crazy as it sounds, the Hawks are 12-4 on this stretch, including last night’s 11-5 victory in Vancouver. It looks like Playoff Fever will be in Boise (now, whether the fans or media buy into it, that is a different story) – as the Hawks need a combination of either two wins or two losses from Spokane and Yakima to clinch their first division crown since 2006. In talking with the staff, there will be no “celebration” – as the median age of the team is under 21 and the Cubs have a policy regarding a “typical” celebration when the majority of players are under the legal drinking age. As much as I’d love to have a champagne/beer shower as I did in 2004 (courtesy of Alfredo Francisco and Jerry Blevins), I also agree with the Cubs – you wouldn’t want something “dumb” to happen. With the Magic Number trimmed to 2, it looks as if we will get to experience Yakima one more time – a final trip to County Stadium, a final trip to the Best Western Ahtanum Inn, a final trip to the Gearjammer Truck Stop for a Subway run, a final stop in the Palm Springs of Washington. It was bittersweet leaving the place on Wednesday morning – as I thought back to the 48 other games I had called in the steamy radio booth (that actually turned a bit chilly in the wind on Tuesday night) – remembering seeing a young Mark Reynolds and Carlos Gonzalez playing in the part, watching Wade Miley make his pro debut. The food also is something in Yakima I am going to miss – year in and year out, I have gotten some outstanding and crazy food. Years ago, it was a philly cheesesteak, or a philly cheesesteak piled on a footlong hot dog; they’ve had huge teriyaki bowls, huge burritos, and huge plates of pulled pork nachos; but this year, they beat them all – the Seattle Dog. Radio man John Hadden alerted me to this one – their big beef hot dog piled high with onions, sweet and hot peppers (similar to an Italian Beef), but with one exception, cream cheese is on the bun. Sounds weird, tastes AMAZING. Border Crossing pro – Bob Grimes is a professional at what he does, whether it be the traveling secretary, whether it be handling the bumps and bruises and the wear and tear of the Boise Hawks, whether it be crossing of an international border. From the time we stopped at the US-Canada border on Wednesday until we crossed, it was just 31 minutes (with three buses in front of us) – but it was just nine minutes from when Grimes left the bus until we crossed, what a great job. Life in Vancouver is as it always is – expensive. We receive 95 cents in Canadian money for every U.S. dollar – whether you go to a bank, the Casino, or even the hotel, it’s 95 cents (I remember getting $1.35 for a dollar not to long ago – are things that bad in America?). Luckily, Subway has a $5.00 footlong special (Salami, Egg Salad, or Ham) – but if you want a beer, be ready to pay $6.00 for a pint (or $28.00 for a 12-pack, or $52 for a case). 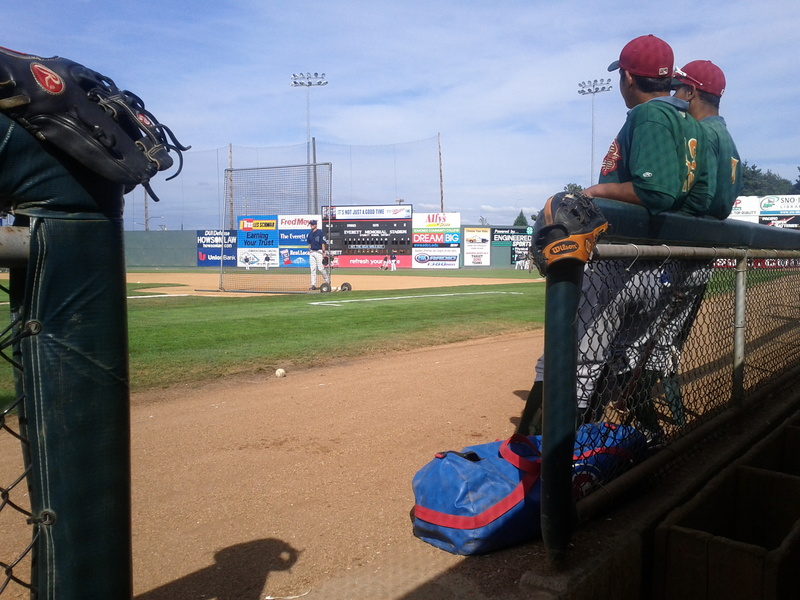 Nat Bailey Stadium is still the old gem of the league – I love their Game Day staff. Rob Fai, their radio man is a riot, as is K.P. Wee, his assistant, and Jeremy Knight, his longtime confidant. They also have an outstanding blog – you should check it out on http://www.canadiansbaseball.com. Had an outstanding pulled pork sandwich and tackled a foot long hand dipped corn dog last night, plus, they have the BEST relish in the Northwest League (was worried it was gone, as I saw the Heinz containers in the concourse, but sure enough, the tart and tangy relish was next to the onions, right where it should be). The ride has been fun – Willson Contreras has a 15-game hit streak, Stephen Bruno’s streak is 14. Albert Almora had a four-hit game last night, Dan Vogelbach continues to be Dan Vogelbach, and Trey Martin continues to kill Vancouver pitching. Hayden Simpson fanned seven in a win, and the Hawks doing this with Jeimer Candelario mired in an 0-for-22 slump. Enjoy the ride – but let’s keep this bus rollin’. 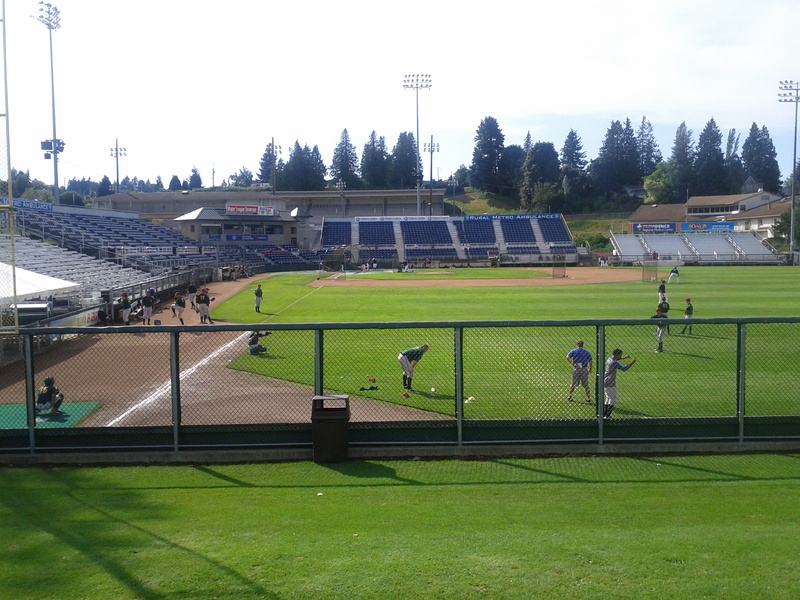 Another night on the road, another win for the Boise Hawks – I honestly do not know what has gotten into this team on the road. In fact, many of the host families who made the trek up to Pasco tonight all wondered the same thing – how does a team go from 2-16 on the road to 9-2 on the road in the span of less than a month. Tonight, it was some timely hitting – two out hits in the third inning by Jeimer Candelario and Dan Vogelbach (legging out a triple), a big safety squeeze by Lance Rymel, and a flat-out crushed home run from Stephen Bruno that helped the team to a 7-1 lead in the fifth inning. Justin Amlung was solid, Mike Heesch rebounded after three rough outings by throwing first-pitch strikes and retired 6-of-7. However, James Pugliese continued to struggle – allowing three runs on four hits in the fifth, but got a key strikeout of Derek Jones to keep the score at 7-4. Su-Min Jung ran out of gas in the seventh and nearly surrendered the lead, but also fanned Jones with the tying run at third. And what can you say about Eddie Orozco – he has embraced the late inning role (was a starter in college), recording his fourth save in four opportunities, moving into a tie for fourth in the league in saves. NO WIND – It has been a rare glimpse into the weather of the Mid-Columbia Valley, as for a second-straight day, there has been no wind to speak of at the park. No dust, no smoke, just pure 100-degree heat. In all of my years, I remember a day or two without the famous wind, but not back to back days. TALKING FOOD: We took a break from reporting on the food from before we took off on the previous road trip – with a new leader in the clubhouse, thanks to my new favorite meal – a turkey sandwich. Home Plate Food Services in Boise began serving a turkey sandwich prior to games earlier this season and it is dynamite, but then when they offered it in Everett a week and a half ago, that was perfect, as we stay away from the hot dog game. Food Standings (as of August 17) – Ham/Turkey Sandwich (12), Chicken Sandwich (7), Pulled Pork Sandwich (6), Pizza (5), Hot Dogs (5), Meatball Sandwich (5), Smoked Sausage (4), Hamburger (4), Chicken Caesar Wrap (4), Philly Cheesesteak (3), No Food (3), Pulled Pork Nachos (2), Salisbury Steak (1), Fish & Chips (1), Chicken Cordon Blue (1). What’s Happened in a Week? My appologizes for missing the past week from the blog – but it wasn’t for lack of effort – as I got the new College of Idaho athletic website launched (you can view it at http://yoteathletics.com) and had to get everything in order on the home front to be on the road for 11-straight days. What happened since – first-rounders arrived. Pierce Johnson, the supplemental first-round pick from Missouri State has made a pair of appearances, including a stellar performance last night vs. Tri-City, striking out five men in two innings, showcasing a devastating cut-fastball. The team played well during the homestand, despite losing 3-of-5 to a much-improved Salem-Keizer team. The Hawks had the lead in the fifth inning or later in all five games, and just couldn’t hold on in a couple of them. Home runs continue to rain for the Hawks, as every position player has at least one home run – with Dan Vogelbach and Rock Shoulders leading the way with eight each. Vogelbach’s seven homers in five days earned him some accolades from the MLB Network, who talked about him on their prospect report. Marco Hernandez had his 18-game hit streak snapped, but Willson Contreras has followed him with an 11-game streak that is still active. Felix Pena has recorded a win in his last three appearances, and Tayler Scott has improved his record to 5-1 this season. The back-end of the pen in Eddie Orozco and Nathan Dorris is solid, the duo combining for seven saves. With the Hawks having won 2-of-3 games in Everett and sitting atop the East Division with a 10-5 record, it’s time to take a quick look at things here in Everett – located about 30 minutes north of downtown Seattle. The first look is that of the ballparks – as there are two Everett Memorial Stadiums (one for baseball and one for football, adjacent to each other) – with the video taken from the locker rooms that serve as the baseball clubhouse. The ball park is unique, with multiple nooks and crannies in the outfield – including a manual scoreboard in straight away right-center that is just 340 feet from home plate. I have always enjoyed the homer porch in right, where fans have the opportunity to sit on a grass berm and catch a home run ball. I also enjoy the vistas from the park – as on a clear day (which is sometimes rare in this parts), you can see the snow-capped Cascade Mountains, including Mount Baker looming large over the left field wall. Food options are vast in Everett, though the prices are definitely more that what you find in Boise – as a Miller Lite will set you back $7.00 (compared to $5.50 in Spokane and $5.00 in Boise), but they have things like chili and clam chowder bread bowls and the biggest bags of popcorn in the Northwest League. The condiment bar is outstanding – and I feel that Everett is No. 1 in that category – with shredded lettuce, tomatoes, sauerkraut, relish, jalapenos, and BBQ sauce, to go along with the typical mustard and ketchup (Salem-Keizer is still the lone yard that has pickles for the fans). The team hotel is one of the better facilities in the league – as the Holiday Inn Downtown Everett is seven stories tall with a quality restaurant and a good breakfast for the team. There are other dining options – but not great ones for the fellas (outside of Dennys) following games. The night life in Everett has improved as the downtown corridor has numerous nightclubs and watering holes. Our final look at the Alumni Report focuses on the two highest levels – the AAA and those in the Big Leagues. Crazy enough, there are more former Boise Hawks in the majors than any other classification, a total of 28 players on current rosters, including eight alone on the Cubs roster. Another seven players are currently playing at AAA that have seen time in MLB this season. C 2006/07 Steve Clevenger Chicago (NL) 47 G .236 1 HR 15 RBI, 9 2B . Today’s look at the Alumni Report focuses on players that typically have been out of Boise for a couple years – players at the Advanced-A or Double-A levels. Strangely enough, only 14 former Hawks are on Advanced-A rosters (California, Carolina, Florida State Leagues), while 18 are currently on AA rosters (Southern, Texas, Eastern Leagues). As the Hawks get set for the final game (and rubber game) of the series at Avista Stadium, it’s time to take a quick look at life here in Spokane – as the first two games here have had monster crowds of 6,913 and 7,012, the first crowd over 7,000 fans in the Northwest League since August 1, 2009 (7,088 fans for a game in Spokane against Eugene). Before we get into life here in the Inland Northwest – big news coming out of Los Angeles today, as two former Hawks, Brett Jackson (who hit .330 with a homer and 15 RBI in 2009) and Josh Vitters (who earned Northwest League All-Star honors in 2008 after .312 with five homers, 37 RBI, 25 doubles and a 25-game hit streak) were called up by the Cubs. Both made their Major League debuts – Jackson (pictured left, courtesy MLB) going 2-for-4 and Vitters flying out in a pinch hit role, becoming the 98th and 99th former Boise Hawks to play in MLB. Jackson also becomes the first member of the 2009 class to make it to The Show. 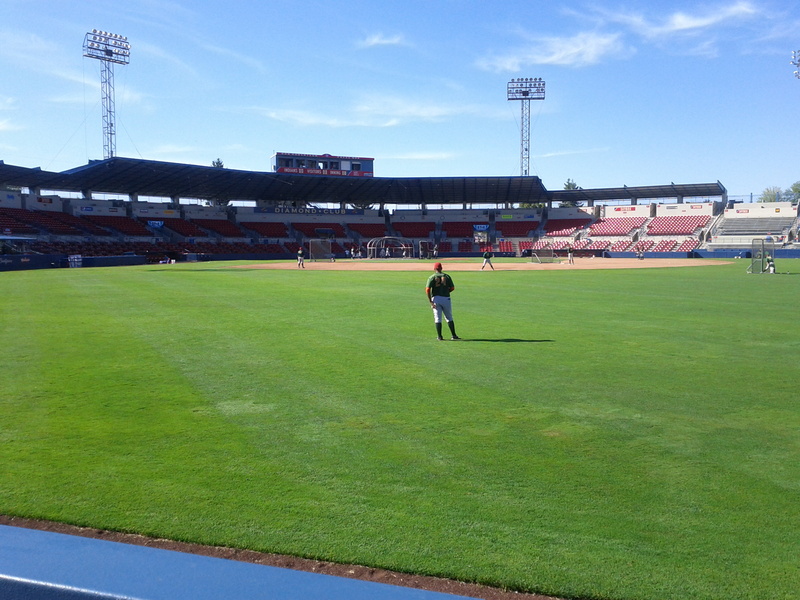 Back to here in Spokane, one of the neat things at the ballpark that has been added in the past couple years is “The Depot” – a group area in right-center field where fans are able to sit right on top of the action. 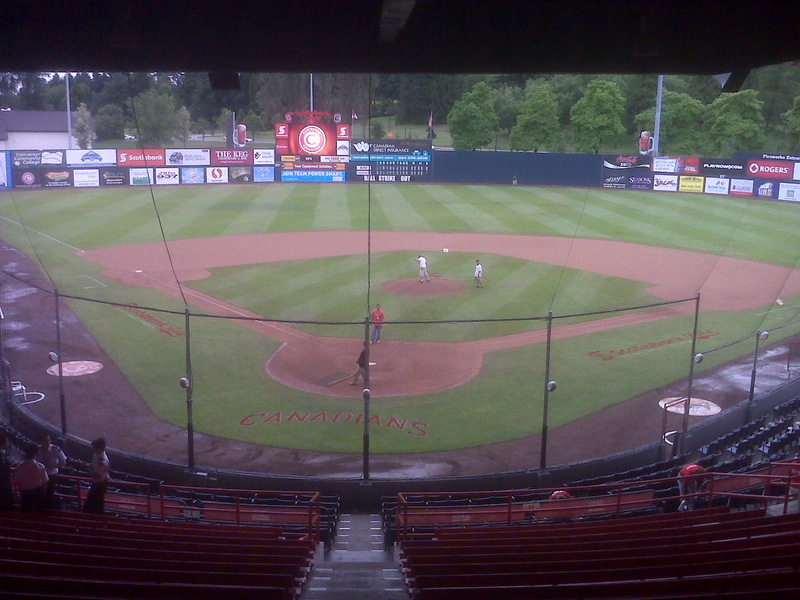 The group area is a part of the larger “Grotto” that was built at Avista Stadium during the 2004 season – a true homer porch that was elevated so fans can sit and mill while watching the game. It is only 296 to the right field corner – where Dong-Yub Kim hit a solo homer in the series opener that might have gone 305 feet total. 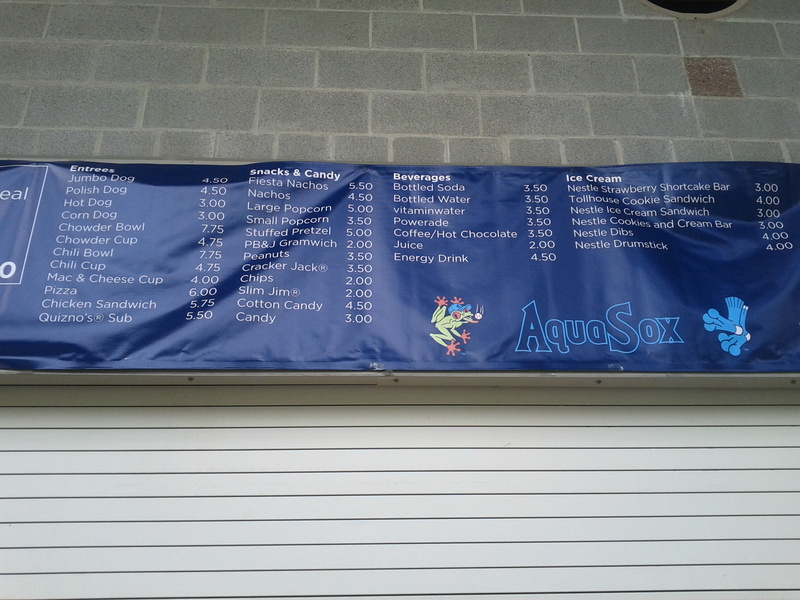 I checked out the concession prices here in Spokane – as one of the things that fans in Boise complained about when we had our “Rant” a month ago was that it was too pricey for hot dogs, beer, pizza, and sodas at Memorial Stadium. 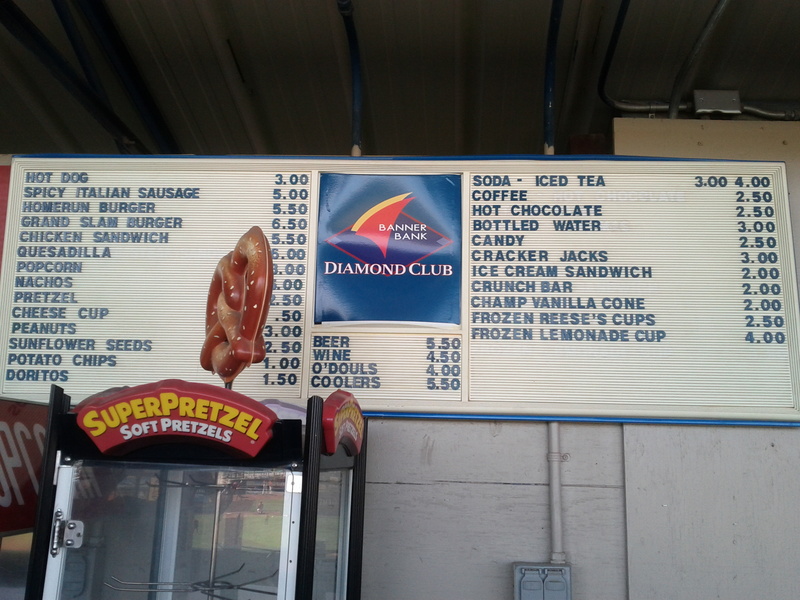 Beer here at Avista Stadium is $5.50, Sodas are either $3.00 or $4.00, while a simple hot dog (which I am not a fan of their hot dogs) are $3.00. A slice of pizza (which is from Pizza Pipeline, which used to have Boise locations) is $5.00. Their condiment bar is basic, with ketchup, mustard, some relish, onions, and sauerkraut – no pickles or peppers. Another downer is the basic pre-game meal option – a hot dog, a hamburger, or a chicken sandwich (just 1), nothing else added (though their PR man Bud is awesome and brought me some popcorn on Friday night), though the soda fountain in the booth (with cold water) is a plus. Took a four-plus mile walk each of the last two days from Georgio’s Gym – where we have held our team lifts each of the past two days, walking down Sprague Avenue back to the hotel. I was amazed at how many businesses have gone under here in Spokane, along with the concentration of tattoo parlors and Asian restaurants. 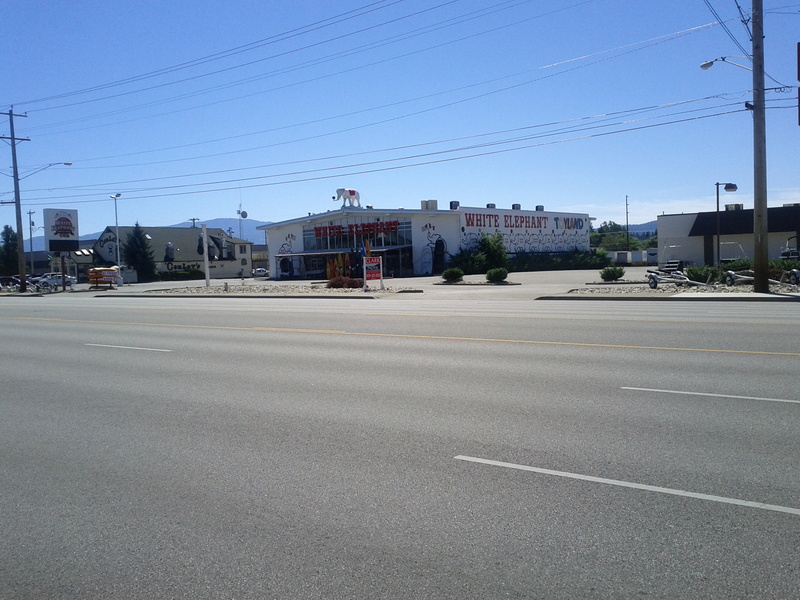 I did come across one of the more unique businesses – the White Elephant Toyland, complete with a huge white elephant on top. There was a Jimmy John’s, a 5-Guys Burger, and your typical fast food joints along the route. NOTES – Dong-Yub Kim left the game in the fourth inning with a knee sprain, he is day-to-day…Matt Iannazzo was solid last night, tossing 2 2/3 innings of shutout relief…he has not allowed a run on the road this season, but has a 27.00 ERA in Boise…Marco Hernandez had a bunt single last night, extending his hit streak to a team-high nine games – the third longest current hit streak in the league…the team will not overnight to Everett, they will spend the evening in Spokane and travel across the state of Washington tomorrow morning for the 7:05 p.m. game. A total of 16 former Boise Hawks are currently on rosters of Rookie teams, while 20 others are currently on Low-A rosters of Major League teams. Of the group in the complex leagues – pitchers David Cales, Mike Hamann, Amaury Paulino, Andrew McKirahan, Ben Wells, and Jose Rosario, infielders Jonathan Mota and Brad Zapenas, and outfielder Reggie Golden – all with the Mesa Cubs, are currently rehabbing injuries, as is Casey Lambert with the Orioles Gulf Coast League affiliate. A total of 16 former Boise Hawks are currently playing professionally in the six indepedent baseball leagues (Atlantic, CanAm, Frontier, NAPBL, Pecos, American Association). The following are the players in the independent leagues. Are We There Yet…Are We There Yet? 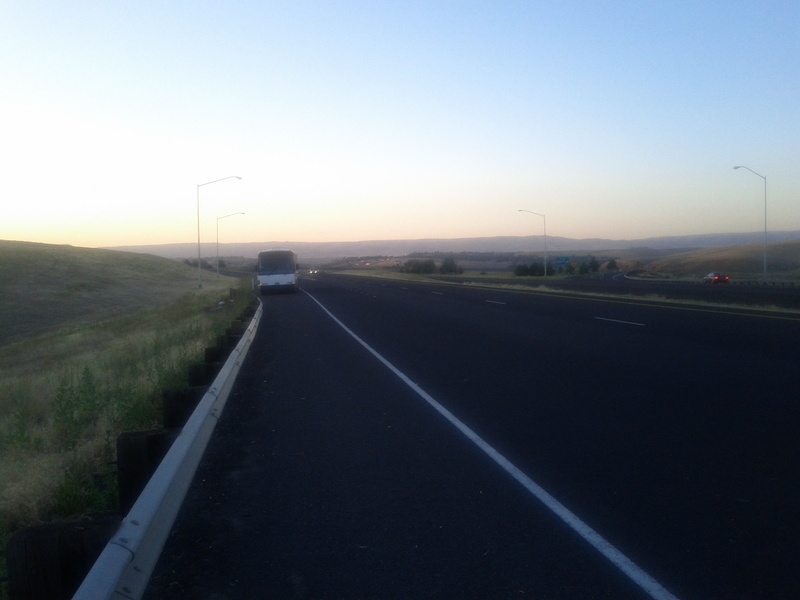 There is always something new for this blog, and maybe since we’ve hit the 20,000 page view mark, we’d need to try something – writing from the side of the road on the bus. 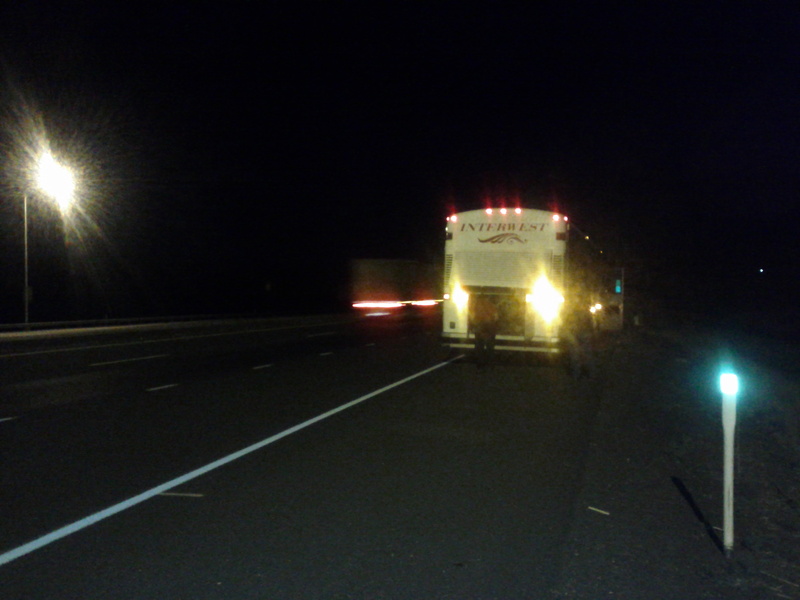 Literally, I am sitting on a guardrail next to Interstate 84 in Eastern Oregon (mile marker 207 is about 100 yards in front of me), as our team bus broke down around 2 a.m. this morning (pictured left). When Hal our bus driver, Bob Grimes, and I checked out the damage in the back (bus engines are in the back of the bus), we could smell coolant and see tons of liquid sprayed atop the outside of the bus. Four hours later, we are still sitting here, waiting for another bus to make its way to Pendleton (and just got word that the replacement bus is still 100 miles away and has a possible air leak). It was an interesting time as a lot of the Extenders – guys who played together in Extended Spring, were outside the bus around 3:30 and relaxing as the temperature on the bus was warm (until I made the startling discovery to open the escape hatches on the roof to let in the air). 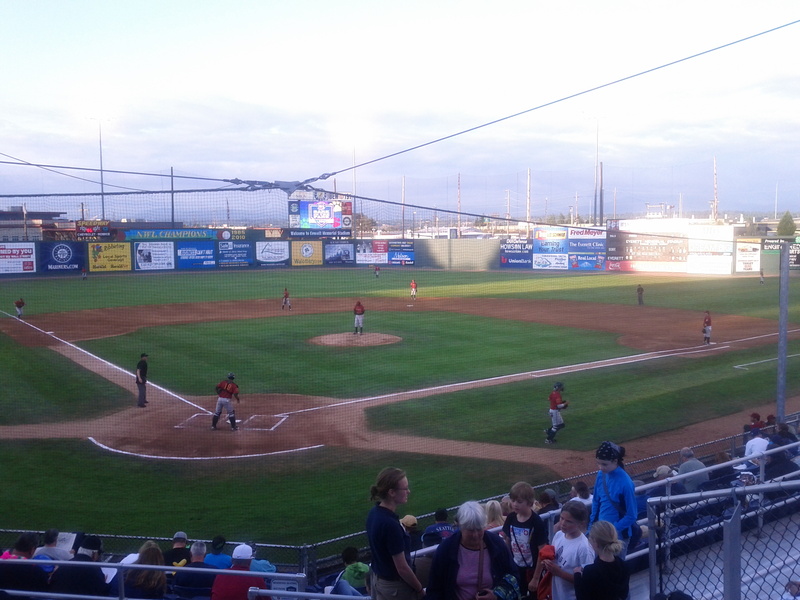 Twitter pictures and video blew up everywhere (you can see a lot of it on @BoiseHawksRadio). We also found out on the side of the road that Rock Shoulders has made the final of the Minors Moniker Madness tournament on MILB.com – he will square off against Rougned Odor (who was the second baseman last season for the Spokane Indians) in the final. Look for a chat with him on MILB.com later today. This morning brings back all of the bus problems I remember over the years – including my first ever ride on a bus as an eight year old. My family went to Disneyland and had a transfer from LAX to our hotel in Anaheim and the charter broke down on the side of the 605 – it made me never want to be on a bus again (those charters in the early 80s weren’t to plush). 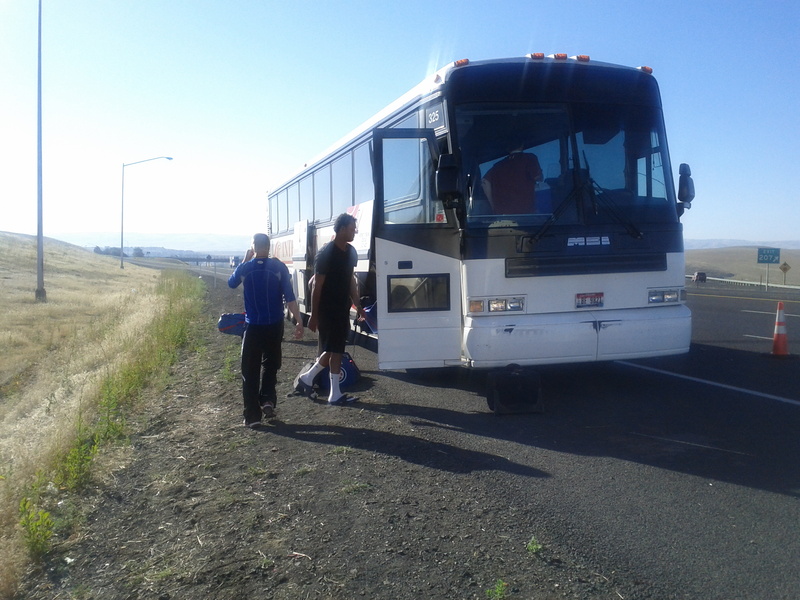 We’ve had a couple bus issues while I have been at The College of Idaho – those, however, weren’t so much breakdowns as weather related. We got stuck for an hour about two miles east of here in a Wendy’s parking lot – when we couldn’t get up a small hill due to the ice. A couple years later (day of the first New England-New York Super Bowl), it was a bit more serious, as we hit a patch of ice and slid off the road 40 miles outside of Klamath Falls – landing at a 30-degree angle in a snowbank (which kept us from tipping over completely). The only way out of the bus was through the emergency windows with the temperatures around zero outside – where we waited for over five hours. I also remember our first trip home from Eugene during the 2003 season, as we were halted by a head-on car crash east of Bend for two hours in the middle of the night. 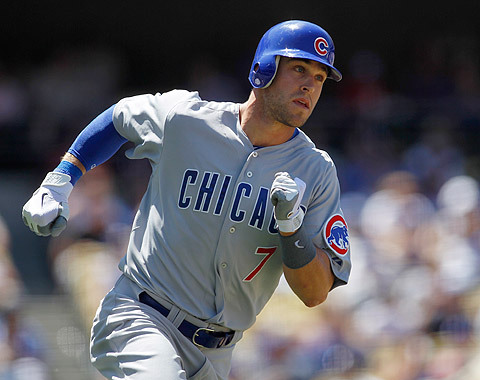 97 GUYS IN THE MAJORS: With the trade deadline shuffling – and former Hawk Geovany Soto getting shipped off to Texas, some movement went on in the Cubs organization. Casey Coleman got called up for a spot start and then sent back to Iowa, with former Hawk Alberto Cabrera getting his first call to the Show. Cabrera, who posted a 3-3 record and a 5.68 ERA with Boise in 2007, made his MLB debut on Wednesday, tossing a scoreless inning in a Cubs 8-4 loss to Pittsburgh, becoming the seventh former Hawk to make his debut this season (joining Flaherty, Gonzalez, Lalli, Parker, Downs, and Beliveau) and the 97th in franchise history. 5 STRAIGHT WINS AND…: A five-game win streak has been rare for the Hawks – a lot of three and four game runs over the last couple years, but the 14-10 win on Wednesday pushed the streak to five for the first time since July of 2008. The luck ran out last night, as the Spokane bats, which recorded 34 runs and 47 hits in the series, finally scratched out a win. 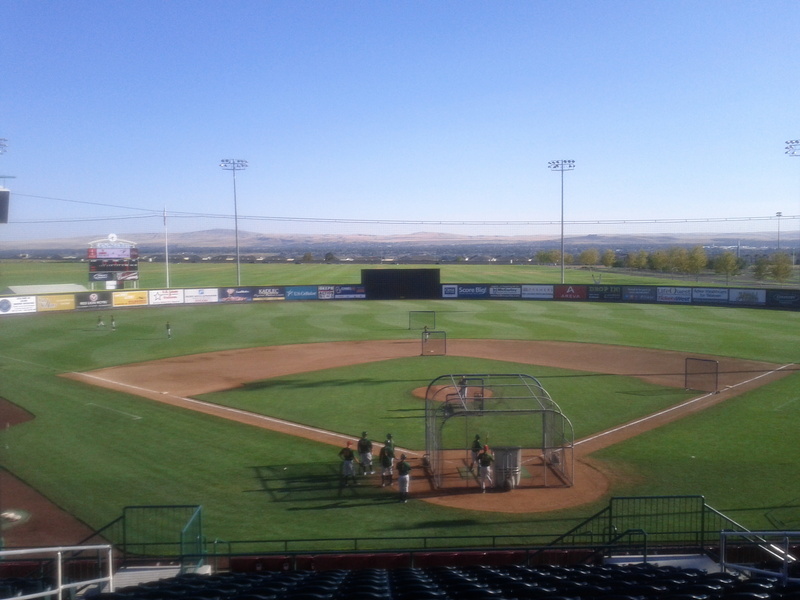 Getting a bit nippy out here from the big rigs rolling by, so going to get back on the bus – hopefully talk with you tonight at Avista Stadium as the road trip begins in Spokane. 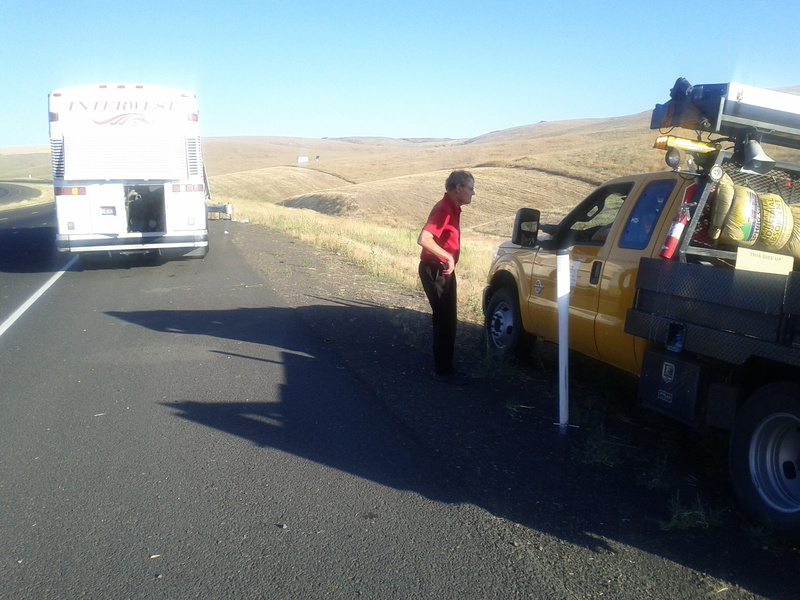 UPDATE ON THE SITUATION – A second bus, which was brought in all the way from Boise (which surprised many of us since there are charter companies in both Pendleton and the Tri-Cities), arrived in at the scene just before 8 a.m. Pacific Time – five hours and fifty minutes from the time we pulled off the road. 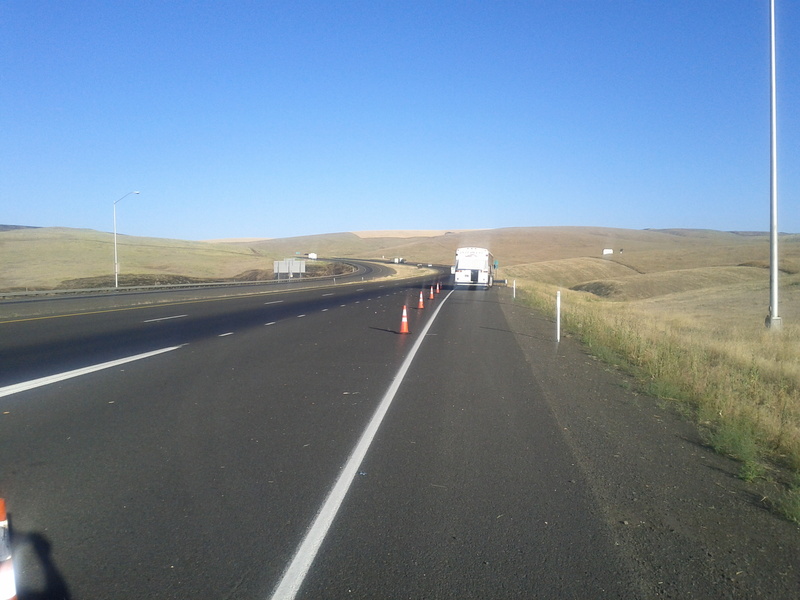 We were visited about 30 minutes prior by an Oregon Department of Transportation worker, who loaned us some cones to set up a safe work area (which I set up – using my years of experience as a worker in the Pierce County Traffic Operations Division from 1994-2001, in fact, was happy that my taper of cones was perfectly straight). 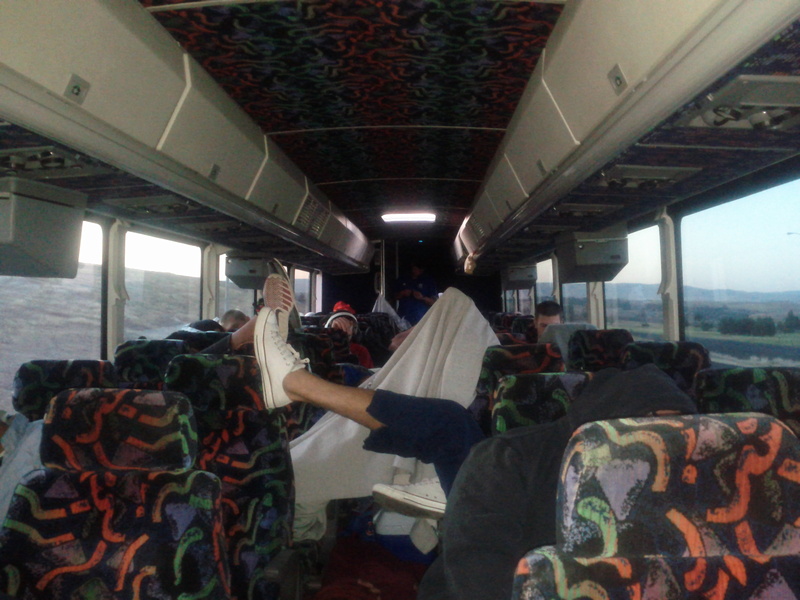 The bus was unpacked and repacked in about 20 minutes – with pitching coach David Rosario and I doing a lot of the packing (loading a bus is like loading the back of a car for a vacation), and we were headed on the road after six hours and nine minutes. Another three and a half hours later, I walked into my hotel room at the Mirabeau Park Hotel at 11:45 a.m. Thanks for the countless tweets and mentions from friends, members of the media, and loved ones for myself and the guys on the team – I honestly think people coast to coast knew what the Boise Hawks were doing early this morning.